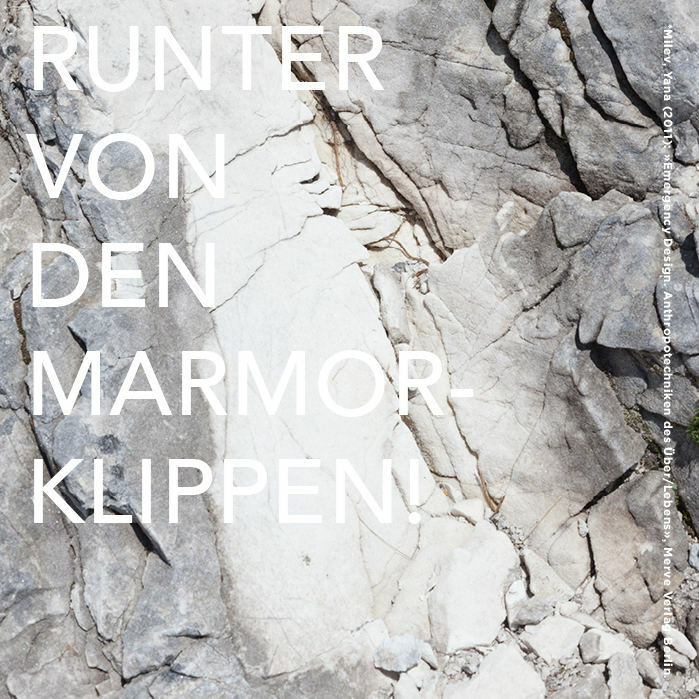 KWADRAT Berlin | RUNTER VON DEN MARMORKLIPPEN! Off the marble cliffs! Into the eye of the storm, suspended in free fall with reality swirling, crushing, racing around us. The title of this show references an aphorism by Yana Milev, a cultural philosopher and artist, who advocates in her concept of Emergency Design a new artistic strategy for dealing with the state of constant crisis modern society seems to be engulfed in. Instead of grasping onto the marble cliffs of established culture, art should be a tool to design the crisis. For “the phenomenon, which I call crisis, is nothing else than life itself: permanent change”. She advocates a new form of cultural capital in which the boundaries between the establishment, politics, art, design, social work, theory, representation and the market are dissolved – an art form where society itself is shaped, in which we are thrown off the precarious ledges into the vortex of change. For change is something we naturally shy away from, inventing ever more creative ways of clutching onto old structures. These have become increasingly precarious in that empirical and social reality have become fragmented, crushed and ground up in the whirlwind of an ever-accelerating historical narrative. Every other day we are confronted with another bomb shell, rocking the very foundations of our civilisation: Racism, terrorism, class struggle, gender trouble and generations drifting aimlessly apart. The same goes for the definition of art, which has been expanded and moulded in countless revolutions in the modern era. Expanded and moulded so far that the horizon is hardly visible anymore. A society in free fall. This is where emergency design comes in and introduces the sculptural positions of this show. In the tradition of Beuys’ soziale Plastik, Wagnerian opera and Schlingensief’s interdisciplinary projects we seek to show how art, especially sculpture, may (re)-unite with life in an attempt to actively shape the state of crisis society is dialectically resisting and embracing. Sculpture and installation, inherently haptic art forms, pose an antithesis to the digital virtual reality nearly all spheres of life are in – abstraction is the postmodern predicament: Food appears, waste disappears, people are banished to the two-dimensional screens, disconnected from the dirt and our bodies. Money has ascended into the realm of the immaterial and is created out of thin air every day by bankers in fantastical cloud-scraping towers. The art work too has evaporated into the mind in that the concept itself is the work, not the exterior vessel that harbours the idea. Sculpture is the eye of the pixelated postmodern blizzard.